We are working with companies to reduce the risk of contamination to the environment. It is one of our primary commitment for our neighborhood. We work hard to help keep noxious materials out of our lands and waters and we are committed to this goal. We collect the oil filters, then deliver them to our recycling partner. The oil filter recycling plan will press the oil out from the filter, shred the metal housing and sent them for re - processing. The metals from the filters goes into products like any scrub metal, the paper and the oil goes to further processing. Used anti-freeze retrieval and recycling. Like the oil filters, we collect used anti-freeze and ship it in barrels to our recycle partner. They will clean it with a special cleaning method and re-use it to produce new - clean anti-freeze to reuse for industrial applications only. Used oil retrieval and recycling. Oil is collected with drums and recycle it for further uses. Also we use many environmentally friendly - Green Car Cleaning Products. These products are completely biodegradable and made form sustainable resources. They are biodegradable within 10 days. These products clean without using harsh chemicals, producing harsh fumes or using corrosive acids. We used them end recommend them for every car owner. These products are free of Volatile Organic Compounds (VOCs) therefore a better choice to preserve the quality of our planet. For your confidence they are available to buy in our shop. Environmentally Friendly Car Cleaning Products and Agent. Contains biodegradable organic salt which is an extremely effective cleaning agent enabling fast powerful cleaning. Dissolves the most stubborn stains, e.g. brake dust deposits, road salt, dirt and tar. 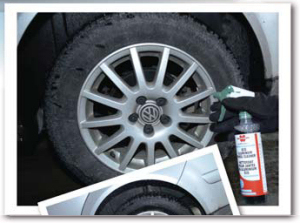 This biodegradable tire cleaning solution does not contain any abrasives that could scratch the surface and as I stated above it is biodegradable within 10 days. This products replace all harsh acids. Hydrogen Peroxide is the world's safest all natural effective sanitizer. When Hydrogen peroxide is in contact with organic material it breaks down into oxygen and water. ECO Fabric & Upholstery Cleaner is highly effective in cleaning various elements. Because ECO Fabric & Upholstery Cleaner Contains Hydrogen Peroxide, it is a surfactants and natural degreasing agents. Hydrogen Peroxide is the world's only only germicide composed of only water and oxygen. ECO Biodegradable Fabric & Upholstery Cleaner is highly effective cleaning grease, mildew, mold and in the cleaning of light corrosion and organic stains, such as coffee, wine, juice, blood and pet stains. Brightens and cleans windows, mirrors and all hard surfaces. Contains no VOC's, alcohol or ammonia. Just spray sparingly and wipe clean. Polish with a clean, lint free, dry cloth. Also there are ECO Biological Floor Cleaner and ECO Lustre Metal Polish is available as well. Cleans and protects at the same time. The Echo Liquid Hand Soap cleans hands gently and thoroughly. Protects the skin. Prevents skin irritation and wont dry out your hands. Ecologically beneficial and biodegradable. Most apply with water. 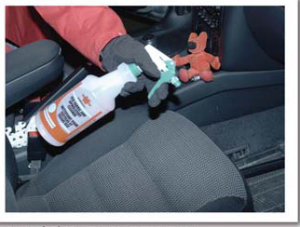 Fruit scented intensive foam cleaner for vehicle interiors. The micro-fine active foam cleans plastics, fittings, door panels, textiles, upholstery and leather. Removes very stubborn stains whilst being kind to the surface and the environment. The special active foam formulation provides outstanding dirt removing power. Leaves a pleasant odor. Does not contain phosphate or organic solvents. AOX-free. Quickly separates in waste water according to ecological standard test B 5105. Biodegradability 95% with a pH value of 8.2. Not irritating to the skin. This product is silicone free. Fruit scented interior care for synthetic surfaces. High quality Carnauba waxes, in combination with Jojoba oil, provide optimal non-corrosive care for your car. Gentle formulation provides lasting protection against the effects of pollution. Anti-static. Does not contain phosphate or organic solvents. AOX-free. Quickly separates in waste water according to ecological standard test B 5105. Biodegradability 95% with a pH value of 8.2. This product is silicone free. AUTOSHAM AUTO SHAMPOO 2 in 1. Environmentally friendly 2-in-1 car shampoo that makes your car wash twice as effective. Wash and wax in one go! Removes dirt from vehicles thoroughly without being aggressive and without environmental impact. Protects the paint by generating a protective coating against various influences. This coating protects against the effects of weather, salt, corrosion, sun light, etc. Can also be used in high pressure water cleaners. Reduces the risk potential in daily work. Saves raw material resources. Avoids waste material. Does not contain phosphate or organic solvents. AOX-free. Rapidly separates according to O-norm test S 5105, so that dirt containing oil and grease is not emulsified but washed out. Biodegradability 95% with a pH value of 8.2. Not irritating to the skin. This product is silicone free. Environmentally friendly engine cleaner for the engine, engine compartment and gear box. Removes oil, grease and other dirt thoroughly and quickly. Very high cleaning performance. Penetrates dirt and is safe on sensitive surfaces such as aluminum, tin, zinc, painted surfaces, plastic components, and rubber. Does not contain phosphate or organic solvents. AOX-free. Rapidly separates according to O-Norm test S 5105. Slightly viscous. Biodegradability 95%. Not irritating to the skin. This product is silicone free. At the top of the page you can see the ECOLogo. EcoLogo is launched by the Canadian federal government. EcoLogo is North America's most widely recognized and respected certification of environmental leadership. Many products make the claim of being environmentally friendly but are not held accountable to their claims. The above products come with EcoLogo certification. EcoLogo certification ensures that not only does the product meet a set of stringent life-cycle criteria, including environmental, health and safety issues and resources and energy consumption, but also that products actually works.